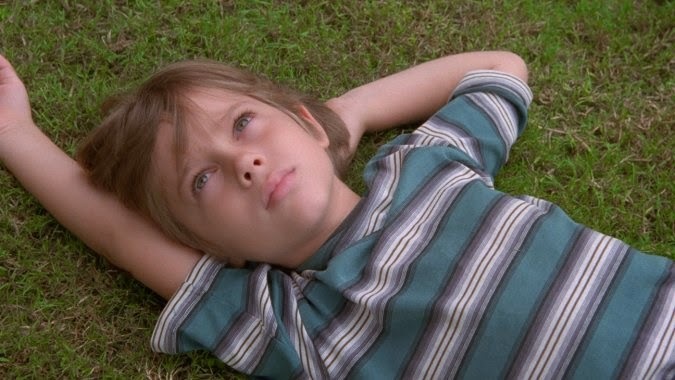 The movie “Boyhood” is a 2014 release that has Oscar nominations for best picture and best director. It is written and directed by Richard Linklater, and tells the story of a young man growing up in Texas from 2002 to 2013. Mason, played by Ellar Coltrane, is seven years old at the start of the film and 19 at the end. The movie is distinctive because it uses 45 days of filming over the course of twelve years to cover Mason’s life. IMDb has more about this extraordinary experience in its Trivia section on the movie. While the movie portrays Mason with intimacy and sensitivity, it throws in a political message. Mason’s father (played by Ethan Hawke) takes his son along to distribute Obama/Biden yard signs during the 2008 presidential campaign. Young Mason meets homeowners who approve of what he is doing and who don’t. Mr. Linklater showcases a caring, welcoming, female supporter of the Obama campaign. This homeowner is all smiles when Mason asks permission to install the sign in her yard. In contrast, Mr. Linklater has Mason encounter a Republican. The Republican is an angry, menacing, older white male who tells Mason to get off his property. How do political stereotypes wind up in cinéma vérité? It’s our American culture, and it’s expected. One of the loveliest things about Boyhood is how much of it makes those long-forgotten strings of childhood vibrate within you. It reminds you of what it was like to be a kid.